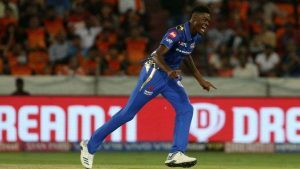 HYDERABAD – First IPL match ever, 22-years-old Alzarri Joseph steamed in, bowled the tournament’s top run-scorer David Warner – off an inside edge – with his first delivery, and went on to have a debut beyond all fantasies. In defence of Mumbai Indians’ 136 for 7, which had only been made respectable by Kieron Pollard’s 46 not out off 26 balls, Joseph produced one of the great IPL bowling performances. He claimed 6 for 12, consistently rushing batsmen with his deceptive pace. Those figures broke an IPL record that had stood since the very first season, bettering Sohail Tanvir’s 6 for 14. Despite being posed with a modest target, even if it was on a tricky home pitch, Surnrisers never got themselves moving. They lost their in-form openers inside the first five overs, and although several batsmen got starts, no one could push beyond 20. Joseph and Mumbai continued to take wickets, and the required rate ballooned. When Rashid Khan fell towards the end of the 15th over, with 49 to get off 25 balls and only three wickets left, the match was effectively sealed. Had Lasith Malinga been available, there is every chance Joseph would still be awaiting his IPL debut, but boy how he grabbed the opportunity. Joseph claimed two wickets off his first two overs, bowling David Warner off his inside edge with his first ever IPL ball, before having Vijay Shankar caught at point off a top edge soon after the Powerplay ended. His two wickets off successive deliveries in the 16th over, definitively swung the game in Mumbai’s direction. He bowled Deepak Hooda with a full, straight delivery, which the batsman inside-edged onto his stumps. Next ball, Rashid Khan was rushed into a pull shot, which the batsman could do no better than top edge – Joseph himself running through to take a simple chance. The final two wickets were almost just a bonus. Bhuvneshwar Kumar had his middle stump pegged back by another full, straight one. Four balls later, No. 10 batsman Siddarth Kaul was caught behind trying to run Joseph to third man. That Kaul wicket concluded the second excellent away result for Mumbai, who in the last two seasons had been infamously slow starters in the IPL. With this victory to follow the one against Chennai Super Kings on Wednesday, Mumbai have announced they are once again serious title contenders. For so much of Mumbai’s own innings, it seemed as if they would not muster a competitive score. They had been a pathetic 5 for 65 after 12.5 overs – four of their top five batsmen having failed to score at a run-a-ball. Pollard, though, eased himself into his innings, hitting 9 off his first 13 balls, thanks to some good fortune (more on that later), before exploding in the 19th and 20th overs. He walloped the first ball of Siddarth Kaul’s final over over long off, before blasting one into the legside stand two balls later, then muscling another into the stand beyond long on two balls after that. Mumbai made 20 off that Kaul over, then 19 off the final one bowled by Bhuvneshwar Kumar, thanks again to some serious luck for Pollard. Very rarely does Rashid Khan let a catch slip through his fingers, but he did so today, and wouldn’t you know it, it was Mumbai’s eventual top scorer that he reprieved. Pollard should have been out for 8 off 13 balls had Rashid held a straightforward chance at deep extra cover. He would go on to pummel 37 off 13 balls after the drop. According to ESPNcricinfo’s Luck Index, the drop cost Sunrisers Hyderabad 21 runs, which very much looks like the difference between the two teams. To make things worse, Mohammad Nabi also dropped Pollard off the penultimate ball of the innings – palming the ball over the boundary to give him six, before Deepak Hooda at long off failed to stop a ball that deflected off his body for four. Although Joseph was easily the visitors’ best bowler, the attack actually put in an excellent performance between them. Jason Behrendorrf claimed 1 for 28 from his four overs, Jasprit Bumrah took 1 for 16 from his three, and Rahul Chahar had struck the first blow, removing Johnny Bairstow in the fourth over of the innings. Chahar finished with figures of 2 for 21, later removing Yousuf Pathan as well.